As a follow up to Monday’s post on the new Chase Fairmont Visa Signature card and the two free nights it gets you at any Fairmont in the world, I thought I’d take a look at the various “Collections” of the new Fairmont Rewards points system and some of the interesting properties where you can use your free nights. Feel free to add in your favorites in the comments section below! 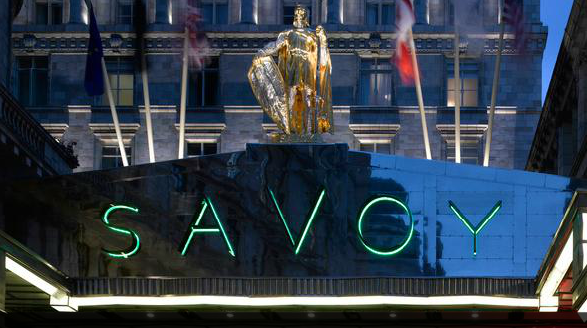 Everyone will probably want to stay at the world-famous (and newly renovated) Savoy in London, but your chances are slim since there’s a quota on free nights, and it’ll cost you 65,000 points for a redemption. You’d need to spend at least $5,000 just at Fairmont properties to get the 25,000 points necessary to stay at one of these properties, $12,500 on travel, or just $25,000 on normal purchases. There are 25 properties total in this collection including 13 Fairmont properties and 12 Swissotels. As one of Fairmont’s larger hotels, the Queen Elizabeth in Montreal is a Collection A property. The Fairmont The Queen Elizabeth is a landmark property in Montreal and has over 1,000 rooms, 100 of which are suites, so your chances of a free stay here seem pretty good. The Fairmont Acapulco Princess’s laidback pool area. Or if you’re more inclined to sunny climes, try lounging poolside at the Fairmont Acapulco Princess, a classic property on the Mexican Riviera. There are 40 properties in this second tier including 11 Swissotels and 29 Fairmonts, and they start at a cut above the basic tier. The pink Fairmont Sonoma Mission Inn is a classic wine country getaway. The Fairmont Sonoma Mission Inn & Spa is one of California’s premier wine-country hotels and has special amenities like s’mores kits to roast out by the bonfire outside the hotel’s entrance. Try glamping at the Fairmont Mara Safari Club. Those seeking a more exotic locale can spend their free nights at the Fairmont Mara Safari Club in Masai Mara, Kenya. Order a cocktail shaken not stirred on the Horizon Deck at the Fairmont Monte Carlo. The sophisticated Fairmont Monte Carlo in one of Europe’s most debonair destinations, and the Fairmont Kea Lani on the island of Maui, a great choice for families. The Fairmont Kea Lani on Maui is a premier family destination. This collection is obviously the most exclusive and requires a fairly massive number of points. It includes 5 flagship Fairmont properties, 5 Raffles and 2 Swissotels. From what I understand, even with the 2 room night certificates, rooms will be very hard to come by at properties like the Plaza and the Savoy thanks to stringent quotas, though maybe you’ll have better luck once the excitement over the new card dies down and people will have to rely on points to stay in these hotels. Here are a couple more you might be interested in. 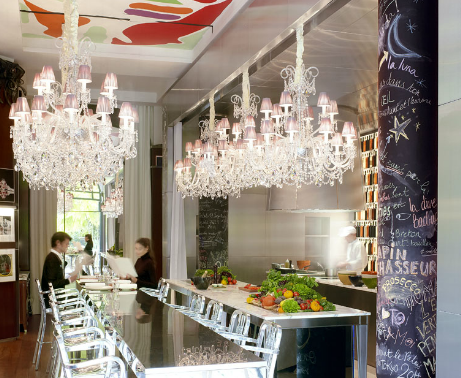 Le Royal Monceau’s gourmet restaurant, La Cuisine. Le Royal Monceau-Raffles Paris is one of the city’s most exclusive properties, just steps from the Champs Elysees and Arc de Triomphe, with a Clarins Spa and a gourmet chef-driven restaurant called La Cuisine. The Fairmont Peace Hotel Shanghai’s landmark Art Deco lobby. 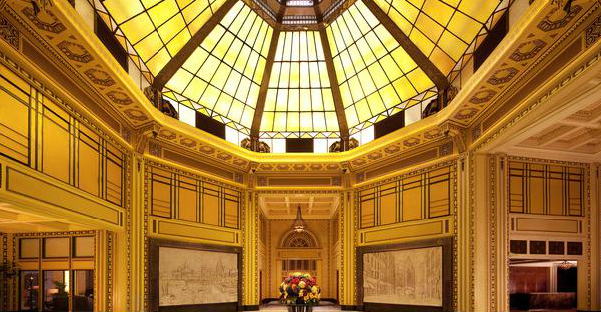 The Fairmont Peace Hotel Shanghai is over 80 years old, and after a recent renovation, is once again a beacon of Art Deco fabulousness.